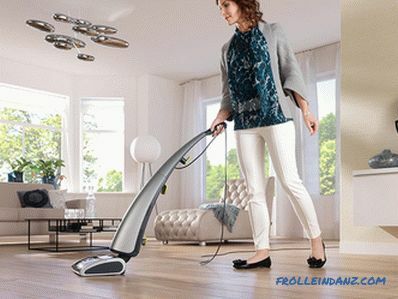 When there is a choice, which vacuum cleaner is better to buy for the home, then it will be necessary to determine not only its power - there are a number of additional parameters that determine the quality of its work and ease of use. First of all, it is the device case, which can be horizontal or vertical. Next, you need to decide on the type of filter element - dust collector, and also take into account such nuances as simplicity and cost of operation, how quickly and efficiently the cleaning is done. Special attention should be paid to the environmental friendliness of the device - how much of the absorbed dust can get back from it into the room - this is especially important for people with allergies and in homes with young children. These are two main groups of devices, the difference between which is visible to the naked eye. Verticals are a cane, in the lower part of which a brush is fixed, and between it and the handle on the case there is a container for the collected dust. 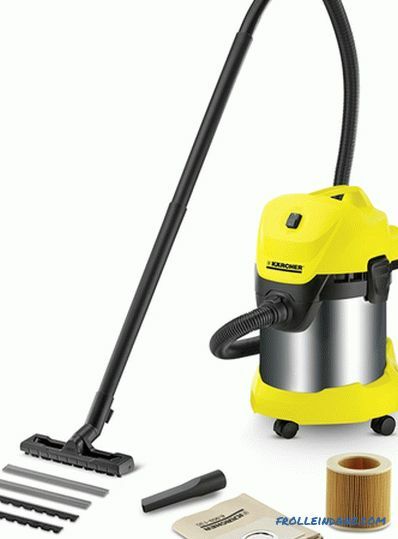 A standard or horizontal vacuum cleaner is essentially a cart on which the engine and garbage bin are located, and a dust collector brush is attached to a flexible hose, the other end of which is connected to the device body. Which vacuum cleaner is better to buy must be solved individually, because each of these designs has its own advantages and disadvantages, which must be considered when choosing. The first thing you have to pay attention to is the weight of the device. Since all the details are focused on his body, it is noticeably harder to hold in his hands during cleaning. If this is an important point, then you need to look for models in which the center of gravity is as low as possible - to the brush that slides on the floor. In wireless models that run on battery power, due to the design features, the engine and dust tank are always located closer to the handle, so they seem heavier in operation. Brush for collecting dust is necessarily completed with a turbo brush or an additional roller for collecting wool and hair from carpets. Wired models are often made with the possibility of "parking" in an upright position - so they take up less space during storage, and it is also convenient if you need to distract from cleaning for a minute. Structurally, it is possible to attach a large garbage bag to such vacuum cleaners. B In some cases, the same power devices may be more noisy than horizontal counterparts. 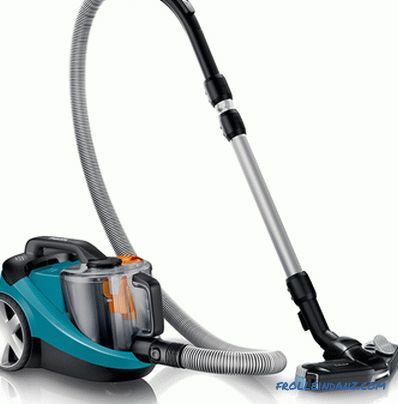 Because of the greater weight, such vacuum cleaners are more difficult to use on "rough" terrain - thresholds, stairs, etc. The length of the electric cord is often significantly less than that of the "big brothers" - in the case simply does not have enough space to reel it. Most often, such vacuum cleaners are used as ancillary to quickly pick up the scattered crumbs or wool from the carpet, although some models are successfully used as the main ones. A familiar, reliable and efficient design, adapted by many generations of engineers for almost any task that may arise during the cleaning process. If necessary, equipped with a variety of nozzles for cleaning hard-to-reach places, plus, there are models for carrying out wet cleaning. When working on weight, it is necessary to hold only a flexible hose with a brush, which is an order of magnitude lighter than the entire vertical vacuum cleaner. Better suited for cleaning hard to reach places, including those that are not on the floor. Structurally, they are more reliable than vertical ones. Despite the high power, the motors of such devices are slightly quieter. With storage take up more space. If there is no additional equipment with the turbo brush, then the standard one can “skip” wool and hair. Some models are rather complicated to operate, especially for washing vacuum cleaners or with aqua-filter. 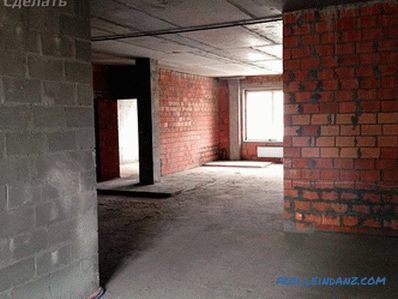 Such models are the most common and adapted for a full cleaning of premises. 1. Rag or paper bag. A classic dust collector, the operation of which is based on the fact that air passes freely through the fabric or pores of a certain paper variety, but there is no dust particles. The neck of the bag is positioned so that it enters the air from a flexible hose connected to the brush, and behind the fabric is an air pump and an electric motor. In the course of his work behind the bag, a rarefied space is created, where air is constantly sucked into the garbage, which is retained by the cloth. 2. Container dust collectors (cyclonic) . The principle of operation is based on the difference in air pressure in the outer and inner sides of the vortex and the centrifugal force, which as a result "squeezes" debris and dust onto the walls of the container. Such devices can have one, two or several stages of air purification - only cyclone or combined with HEPA-filters. 3. Container with aqua-filter. The capacity here is a container filled with water. The air sucked in through the brush with particles of debris and dust passes through a column of fluid in which all the dirt is trapped. The container itself is usually made of transparent plastic, for easy control of water pollution. Each of the types of dust collectors has its advantages and disadvantages, and in order to choose the best option, then we compare the vacuum cleaners equipped with them. This parameter is centered on the convenience of having to perform additional actions before and after cleaning. Bags . To get started, the vacuum cleaner is enough to connect to the mains and it is ready to work. This is one of the most unpretentious structures, and rarely requires additional actions, in the form of shaking out debris from the dust collector. Even low-end models are equipped with a sensor for filling the bag with garbage, which is triggered when the air flow is already difficult to pass through the fabric. Container . After the end of each cleaning, you need to shake out the garbage from the container - remove it from the vacuum cleaner and empty the contents into the garbage bag. At the next cleaning the device is immediately ready for use. During operation, there is one drawback - if for some reason the air intake is clogged, then the vortex formed in the dust collector will disappear and you will have to wait until it is formed again or restart the vacuum cleaner. At the same time, it is likely that a large amount of garbage for which it is not designed will immediately go to the next stage of filtration, which will significantly accelerate its wear. Aqua-filter . Such a vacuum cleaner should be prepared in advance for work, and when wet cleaning with the use of detergents is carried out, then in addition to water, the defoaming additive should be poured into the tank. Otherwise, a large amount of foam may form in the tank. Some inconvenience is caused by the need to always maintain a strictly horizontal position of the vacuum cleaner and move it around the room very carefully so that water does not splash in the tank - otherwise strong splashes and leaks can occur. After cleaning, the vacuum cleaner with an aqua-filter necessarily requires washing, cleaning the filters and drying - otherwise an unpleasant odor is inevitable. It is recommended to keep the vacuum cleaner disassembled, which increases the amount of space and time to prepare it for work. Since cyclones and vacuum cleaners with a vacuum filter have certain drawbacks, some manufacturers make “dual-use” devices - which work not only with their dust collectors, but they can also have regular dust bags. Any vacuum cleaner draws air in, along with debris and dust particles. Another question is, what are the chances for small particles to jump back into the room along with the "spent" air flow, which is being brought out, because each of the varieties of dust collectors may delay different dust particles in different ways. Bags . 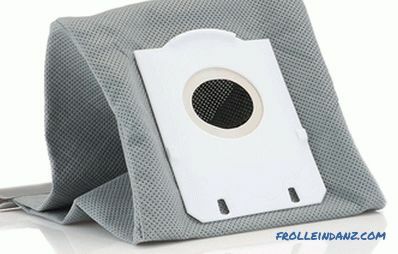 In order for the vacuum cleaner to work efficiently, at the same time it is necessary that the pores of the bag are small enough to trap dust, but at the same time allow a powerful stream of air to pass through. One bag will not be able to cope with this task; therefore, such a vacuum cleaner always has additional filters - the final cleanliness of the cleaning depends on the quality of their performance. Container . From the design of such a vacuum cleaner, it is clear that two forces simultaneously act on dust particles - centrifugal and air flow. If the first of them copes with relatively heavy particles, then the second does not allow to qualitatively filter out fluff and wool.Therefore, cyclone vacuum cleaners are always equipped with additional filter elements, the quality of which also needs to be paid attention to when buying. Aqua-filter . The problem for such dust collectors becomes garbage, particles of which are not wetted by water. This may be a water repellent fabric, greasy wool or hair, chips or particles of plastic materials. As a result, such vacuum cleaners also need several cleaning steps, the quality of which also determines the final cleanliness of cleaning. 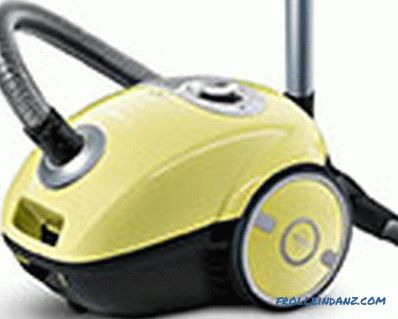 As a result, the quality of cleaning of all vacuum cleaners, without exception, depends mostly on fine filters. If there are allergies or small children in the family, then it is on them that one should pay attention when buying. Usually, the most unpleasant part of using a vacuum cleaner is the process of removing debris that has accumulated during cleaning. Bags . 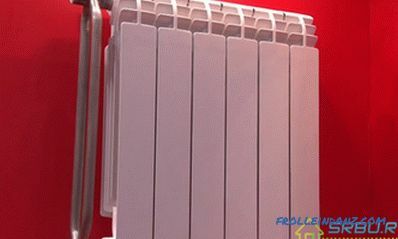 It all depends on the type of dust collector - single or reusable. 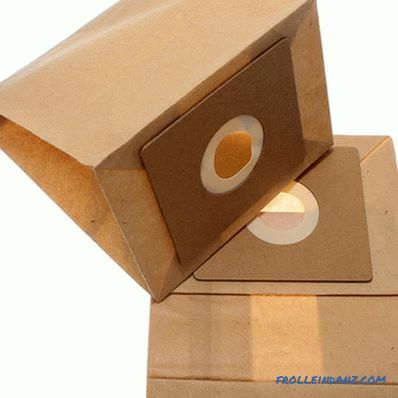 In the first case, there are no problems at all - the old bag is removed and discarded along with the garbage, and a new one is installed in its place. True, the old bag is still advisable not to shake, since a sufficiently large amount of dust can get enough sleep. If a reusable bag is used, then you have to be prepared that shaking out of it debris and dust is a rather unpleasant procedure. It is also necessary to take into account that the bag is free from dust approximately once every 1-2 months and during all this time the garbage remains inside the vacuum cleaner. This is already a great environment for all sorts of microorganisms, and if moisture gets there, then the conditions for their development will be almost perfect. Container . After cleaning, the container of the dust collector is simply detached from the vacuum cleaner body, and the garbage is thrown away. The whole procedure takes a maximum of a minute. If necessary, the container can be washed under running water, but usually there is no need for this. 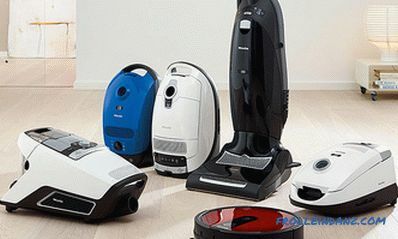 The main problem of such vacuum cleaners is the high ability to accumulate static electricity, due to friction of air and dust on the dust collector case. If a person is often “struck with static”, then from such a device one must constantly expect a dirty trick in the form of an electric spark when touching the case. If a whirlwind gets lost during the operation of the vacuum cleaner and debris clogs the fine filters, you will probably have to carry out their unscheduled cleaning, which in itself is quite dusty. Aqua-filter . The weakest point of this system is the additional filters. If the rest of the vacuum cleaners through them are mostly dry air, then there is always moisture, which is also delayed. This creates excellent conditions for mold, fungi and bacteria and the next time you turn on the vacuum cleaner, the spores of these microorganisms will fall into the air and scatter throughout the room. The price range for all vacuum cleaners can be quite wide - from 30 to 1000 y. e., but when buying it, the cost of the device itself is at least one of the main, but far from decisive factor. Many models require additional investments in the process of operation, so you need to pay attention to the availability of the necessary consumables for sale and their price. Bags . If a reusable bag requires replacement only after its physical wear and tear (for example, it can spoil debris with sharp edges), when using disposables, their cost should be included in the budget as mandatory expenses of about 1 y. e. once in 1-2 months. Container . Although such a vacuum cleaner does not require replacing the dust collector, over time, fine filters, which also cost about 20 - 200 y, will become unusable. e., is not always there in the free market. 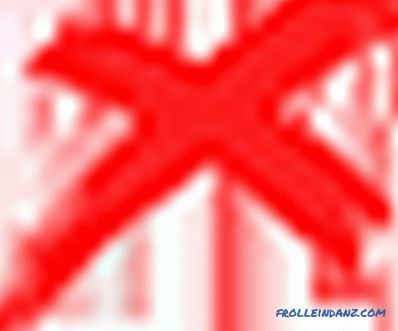 If you fail to find such a filter, you will have to either tinker with it manually, or purchase a new vacuum cleaner. Aqua-filter . In addition to the same problems with filters as cyclonic vacuum cleaners, here, in addition to the expenditure item, the need to purchase defoaming additives, which are indispensable for cleaning with detergents, must be attributed. 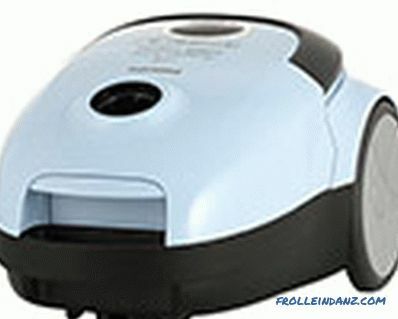 For the sake of fairness, it must be borne in mind that these shortcomings are mainly present in budget-type vacuum cleaners, with a device price of up to 300 y. e. More expensive models, the price tag on which starts from 400 y. e. can already be equipped with additional protection and almost eternal, washable additional filters, so the cost of their operation can be reduced to the amount of electricity consumed. In order to understand what the difference between using all types of vacuum cleaners really is, of course, it is best to try them yourself, but buying all the models of devices just to find out which one is better is not practical. 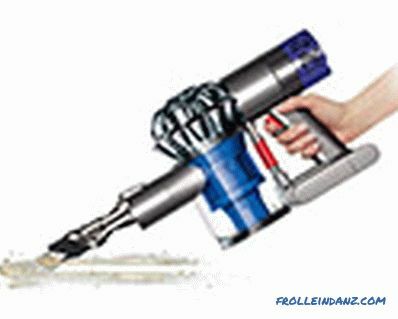 Feedback in this case comes to the rescue, which customers leave on the forums - on the basis of which we have formed a peculiar rating of vacuum cleaners - reviews of the best models with various designs of cases and dust collectors. 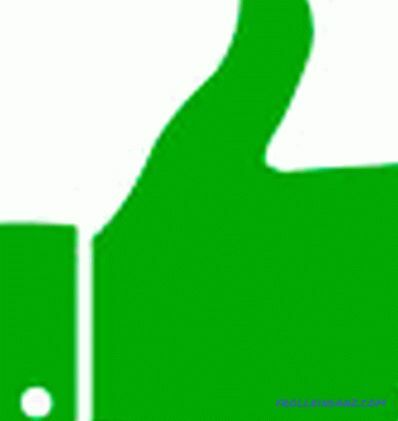 The leaders in this category are products of famous German companies Miele , Thomas, Bosch and the Dutch brand Philips. Despite the similarity of characteristics, each of the vacuum cleaners has its own characteristics, making it the best for buyers. Vacuum cleaner for dry cleaning. 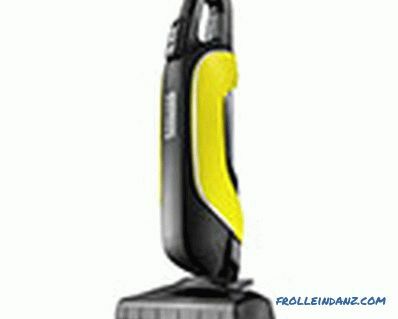 Equipped with a 2000 Watt engine with adjustable speed, nine-stage cleaning system. For the collection of garbage used bag, with a capacity of 4.5 liters. Included is a nozzle for cleaning different types of surfaces. The length of the power cord is 5.5 meters. 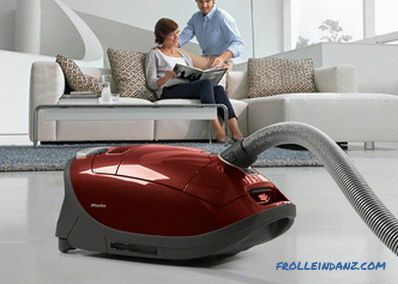 Speed ​​adjustment allows you to use the vacuum cleaner in several operating modes. High engine power, respectively, air intake. The cord length allows you to clean large enough rooms without switching to other sockets. The well-thought-out wheel size makes it easy to move the vacuum cleaner on various surfaces - tile, laminate, parquet. Nozzles are stored in the case of a vacuum cleaner - they are hard to lose. Bags are replaced quite rarely - about once a quarter. Consumables although inexpensive, they require regular replacement. The class of the device affects the price, which is much higher than the budget analogues. A large number of cleaning grades means the same number of different filters that will eventually need to be replaced. Negative opinions about this vacuum cleaner are associated only with its cost - if this question is not in the foreground, then the model can definitely be recommended for home use. Horizontal vacuum cleaner for dry cleaning. The garbage is collected in a bag with a capacity of 3.5 liters, and the fine air purification is performed with a HEPA 13 filter. Equipped with a 2000-watt engine with speed control, it is designed for 5 modes of operation. The length of the power cord - 8 meters. Low noise compared with budget models. The set has nozzles for different types of cleaning, including a brush for furniture. High suction power - even when running in economy mode. The HEPA filter "does not release" any smells from the vacuum cleaner. The dimensions of the vacuum cleaner and the successful device of the wheels determine the high maneuverability of the device and the ease of movement around the room. 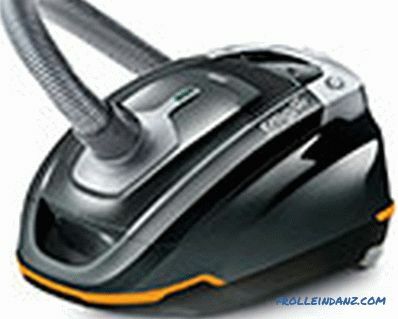 There are complaints about the quality of plastic - the vacuum cleaner itself and additional attachments. The brandy case of the device - dust is clearly visible on it and scratches appear rather quickly. The need for regular replacement of consumables. In a review, users recommend this model for home use, as a reliable and unpretentious device with broad functionality and good value for money and quality. 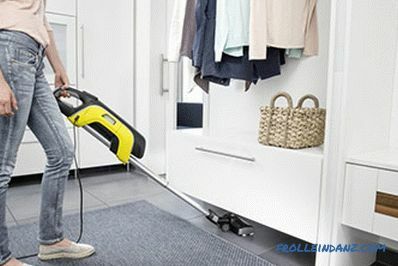 Powerful horizontal type vacuum cleaner for "dry" cleaning of premises. The power cord with a length of 8.5 meters, plus a flexible hose and a telescopic tube for fixing the brush, allow for a comfortable cleaning within a radius of 10-11 meters from the outlet. The engine with speed control and a maximum power consumption of 2200 watts, allows you to develop the suction power up to 450 watts. At low engine speeds, the noise from his work is significantly reduced. Compact and manoeuvrable. The rear wheels of large diameter make it easy to move the vacuum cleaner through the rapids. Included is a turbo brush for cleaning carpets from wool, thread, hair, and similar debris. The devices in this price category are manufactured in factories in Germany. No opportunities to choose a color - only yellow. Although the vacuum cleaner is completed with additional nozzles, it will be necessary to buy additional furniture for it. The turbo brush makes the vacuum cleaner louder. Power adjustment is not duplicated on the brush handle. In the complete set there are no additional consumables. The shortcomings noted in the reviews are rather subjective - even those owners of this vacuum cleaner who left them tend to recommend this model for purchase. 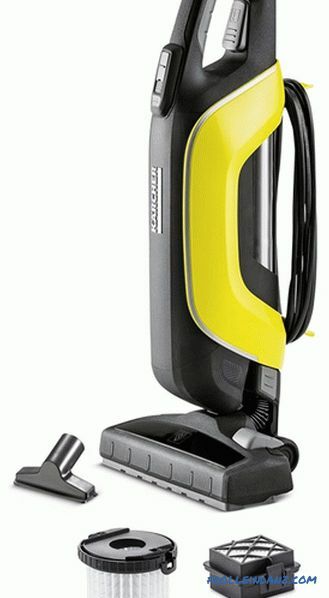 2100 Watts of the engine allows the vacuum cleaner to develop 425 W suction power, and you can adjust it on the handle without bending down to the vacuum cleaner itself. Garbage is collected in a large bag with a capacity of 4 liters, and 6 meters of the length of the power cord plus a tube and hose allow cleaning within a radius of 9 meters from the outlet. High suction power, even at minimum speed. At low speeds, the noise level allows cleaning even indoors with a sleeping child. Capacious bags for garbage collection. Duplication of engine power control, switching it on and off to the brush handle makes it easy to change modes of operation. The plastic quality of the case leaves much to be desired - the vacuum cleaner attracts a lot of dust. Despite the large rear wheels, the front is not designed in the best possible way, which is why some maneuverability suffers. Often the vacuum cleaner is difficult to roll back a little. The engine power control unit in the handle is too big and is not always comfortable in the hand. All the characteristics of this vacuum cleaner are selected as if to find a middle ground between power, functionality and price, which, although not the lowest in the market, will give a head start many peers from competitors in this class. 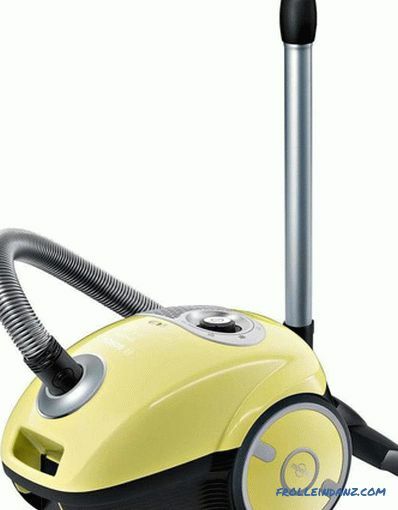 Choose the best cyclone type vacuum cleaner between the brands from Germany and the Netherlands - these are Karcher and Philips products, but they are also worthy in this category the competition is LG technology from the Korean manufacturer. The main purpose of a vacuum cleaner is “dry” room cleaning, and a cyclone filter or a 17 l dust bag can be used as a garbage collector. The relatively small power of the engine, only 1000 W, allows to give out the power of air suction at the level of 200 W, which is quite enough for domestic needs. Reliability, which is repeatedly noted in user reviews, a vacuum cleaner is able to work successfully and for a long time in various conditions. The design of the brush eliminates the likelihood of carpet or other similar coating sticking to it. Versatility - despite the class of vacuum cleaner for "dry" cleaning, it also successfully copes with water suction. 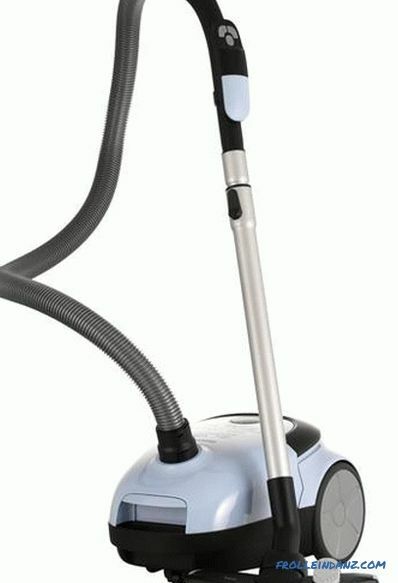 Easy to handle - the vacuum cleaner has no operating modes - it can only be turned on and off. There is an air blowing mode. Due to the large size of the vacuum cleaner, the whole structure seems flimsy, although no damage was noted by users. "Exhaust" air comes out of the vacuum cleaner in a powerful stream - a consequence of the blowing function. There is no mechanism for winding the cord - you have to fold it manually. Short range - the length of the power cord is only 4 meters. Non-standard and expensive garbage bags. Universal workhorse for cleaning a private house or apartment. Also suitable for maintaining order in the garage or at the cottage. 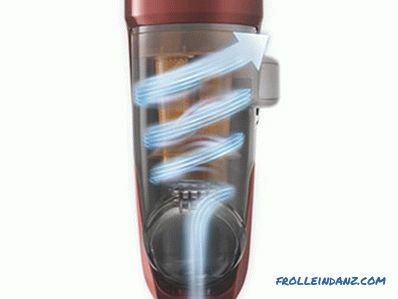 A vacuum cleaner with a cyclone filter for dry cleaning. The engine with an energy consumption of 1800 watts allows the development of suction power up to 380 watts, which is enough for cleaning any type of flooring. The capacity of the 3.5 liter dust bag is enough even for long-term cleaning. Washable HEPA filter - does not require periodic replacement. Additional tips included. The TriActive brush is not inferior in its characteristics to turbo-brushes for collecting wool and hair. A long power cord - 10 meters - allows you to clean with a minimum of switching between outlets. Compact size and good maneuverability - large wheels make it easy to move the vacuum cleaner through the rapids. The body of the vacuum cleaner during operation accumulates static electricity, so you must carefully remove the dust bag. 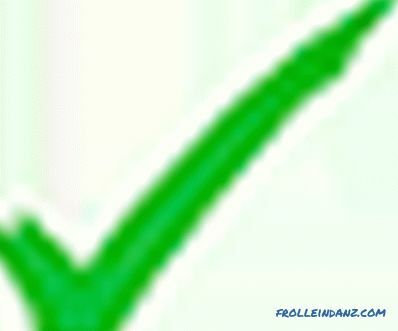 Also, because of the static, fine dust adheres to the tank - it is advisable to rinse the container after each cleaning. The metal tube for the brush slightly increases its weight, which must be held in the hands. 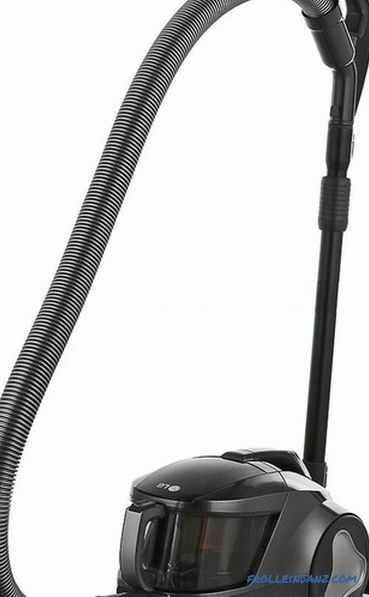 The majority of users rate this vacuum cleaner perfectly and recommend it for purchase as a powerful and reliable device for cleaning the house. 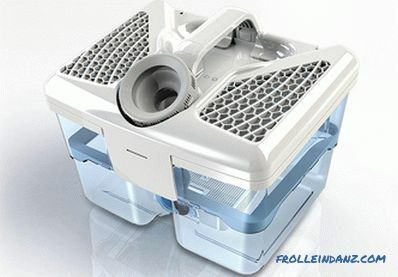 A horizontal vacuum cleaner with a high-capacity cyclone cleaning filter that can hold 1.5 kg of dust. Equipped with an engine with a power consumption of 2000 watts, which develops an air intake capacity of up to 380 watts. 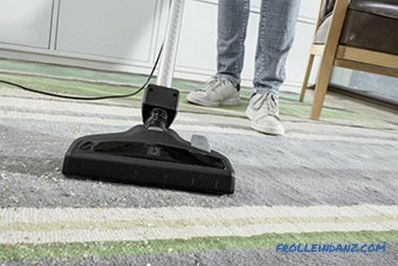 The power cord with a length of 6 meters allows you to clean in sufficiently large rooms without switching. The device has enough power for cleaning all types of flooring and carpets with a long nap. Easy removal of the waste bin for cleaning. There is a power regulator with control on the case and the handle - it is possible to set the optimum mode of operation during cleaning. The vacuum cleaner is easy to move around the room, and large-diameter wheels help you drag it through the rapids. 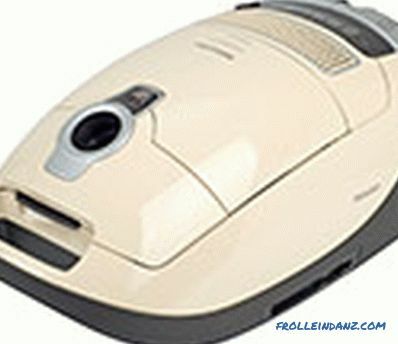 Value for money distinguishes this vacuum cleaner from many competitors. Noisy vacuum cleaner, especially at maximum power, but if quiet operation is needed, then you can switch to low power mode. It is necessary to get used to the location of the power regulator - it is easy to hook it in the cleaning process. It is advisable to wash the filters before cleaning. The vacuum cleaner is designed for home use and copes with its task without complaints, especially since there is always the opportunity to turn on the minimum mode of operation, in which the sound of its operation does not will annoy others. The most common vacuum cleaners of this type are in the USA, but the best models for the European market are made by local brands - British Dyson, French company Tefal and German manufacturer Karcher. 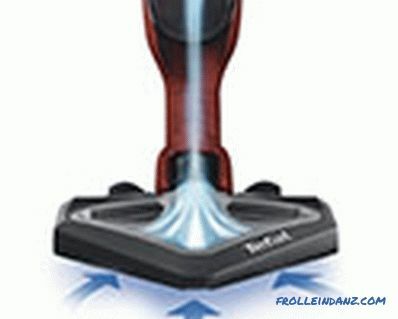 A vertical bagless and cordless vacuum cleaner with a cyclone filter. Equipped with an engine with a power consumption of 350 kW with a suction power of 100 watts.The capacity of the dust collector 0,42 liters is fully enough for the entire 20 minutes of continuous operation, which is designed for the batteries of the vacuum cleaner. Not tied to a power outlet - a charged battery lasts for 20 minutes of continuous operation, which is more than enough for cleaning . A wall mount allows you to store a vacuum cleaner in any convenient place, and with its dimensions, it takes up very little space. 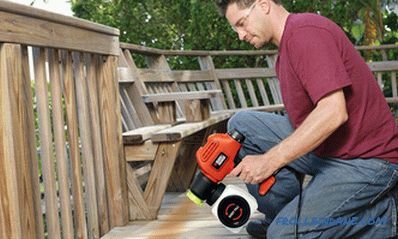 The swivel brush provides excellent maneuverability, and if you connect an electric brush, it will also collect wool, threads and hairs in addition to dust. In addition to cleaning the filters does not require special care. 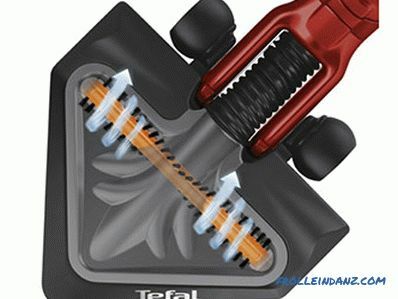 Mobility and the availability of various nozzles allow you to use this vacuum cleaner and for cleaning the car's interior. If you do not meet in 20 minutes, for which the battery lasts, then it will take 4.5 hours to charge it. 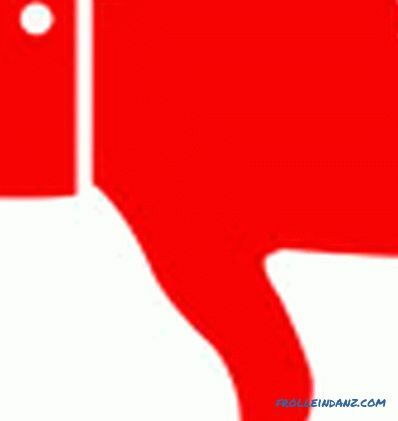 If it is necessary to remove garbage with large particles, then the capacity of the dust collector may not be enough. 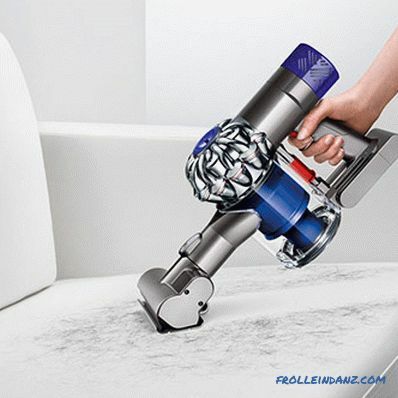 Unlike most horizontal cyclone vacuum cleaners, the Dyson V6 Fluffy cannot be used for collecting fluids, even in small quantities. For some customers, the cost of the device may force them to look for analogues from competitors. Despite the good performance, you should not consider this vacuum cleaner as a complete replacement for the "big brothers" - yet the power is not enough for this. This is the ideal support option, which is always at hand and ready to work at any time, if you need to quickly remove the scattered crumbs and similar garbage. Cordless cordless vacuum cleaner with a cyclone filter for dry cleaning. Battery charging time is up to 10 hours, after which the vacuum cleaner can operate completely autonomously for up to 35 minutes. To install a suitable mode of operation, a power regulator is provided, and if necessary, clean the pile carpet with a turbo brush. The power of a vacuum cleaner is enough for the tasks assigned to it - quick cleaning of spilled cookies on a hard surface or carpet. The cyclone filter is as simple as possible to use - the contents of the flask are simply poured into the bin, and the container itself, if necessary, can be simply rinsed under running water. The battery allows the vacuum cleaner to operate for half an hour at maximum power - this time is more than enough to even complete cleaning. There is no need to replace consumables - fine filters are also sufficient to periodically rinse with water. The swivel brush allows you to get even to hard-to-reach places. Permanent to hold in hands 3 kg of weight at long cleaning for some users becomes somewhat burdensome. 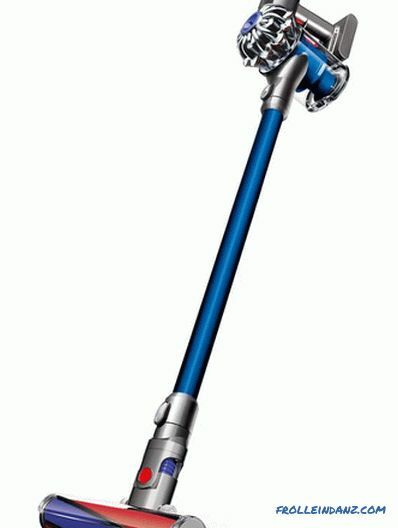 Long recharging time - 10 hours - if you discharge the vacuum cleaner during a full cleaning, and then accidentally litter, you will have to use a broom. In some cases, the capacity of the dust collector may be insufficient. 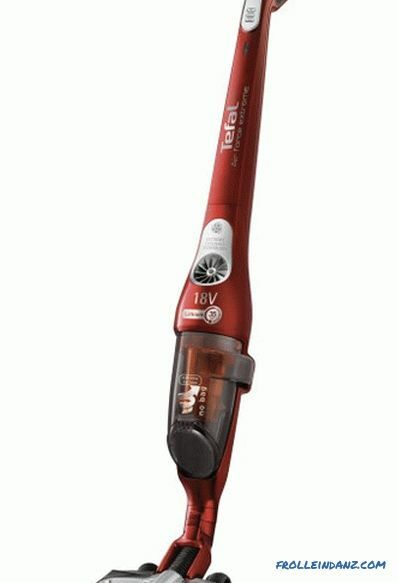 If you need to have an additional vacuum cleaner, which is always ready, in terms of price and quality, buying a Tefal TY8813RH will be the best solution. Upright vacuum cleaner for dry cleaning. Equipped with a 500 Watt engine, without a power regulator and a three-stage air cleaning system. The capacity of the dust collector is 0.2 liter, and is designed for short-term cleaning time. The length of the power cord - 9 meters. 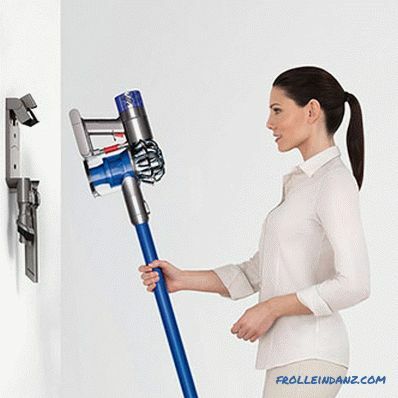 Telescopic suction pipe allows you to adjust the vacuum cleaner for a person of any height. The maneuvering brush allows you to vacuum out hard-to-reach places and has an original, lint-free design, to which threads, hairs or wool usually cling. 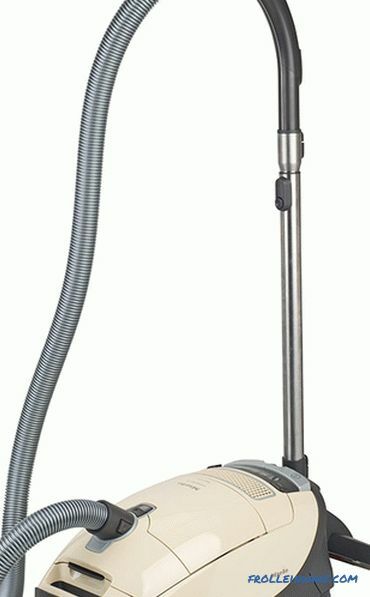 Compact in storage - the telescopic tube retracts inside the vacuum cleaner and as a result, it takes up almost half the space than the standard horizontal model. 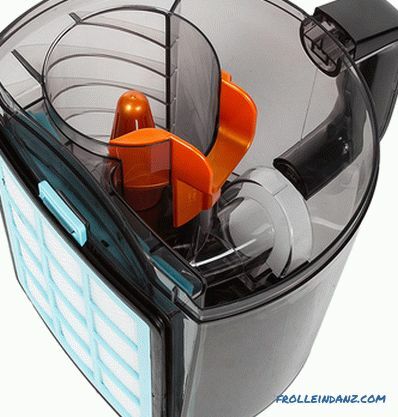 Washable filters for cleaning the air coming out of the vacuum cleaner. With relatively quiet operation, it has a good suction power, the level of which is almost the same as horizontal models. The small size of the dust collector limits the operation time to the need for its cleaning. There is no automatic winding of the cord - you have to unwind and reel it manually. The telescopic tube can be folded during the forward movements of the brush over the carpet. After pushing the telescopic tube apart, all the heavy parts of the vacuum cleaner are in the area of ​​the handle and all this has to be kept on weight. Not critical for point cleaning, but noticeable with prolonged use. The size of the dust bag clearly indicates that, according to the engineers, this vacuum cleaner should “be in the air” so that it can be quickly brought into working position. 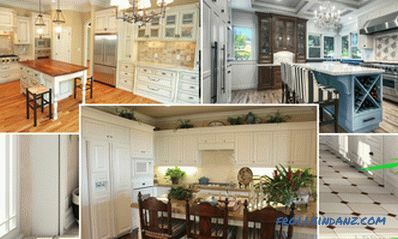 If the house accumulates a lot of dust, then it is better to consider as an auxiliary option.